My squirrel bins, those containers of Distractions of All Things Family, frequently offer up mysteries, usually in the form of memorabilia that make me wonder why they were kept, and why I have them. 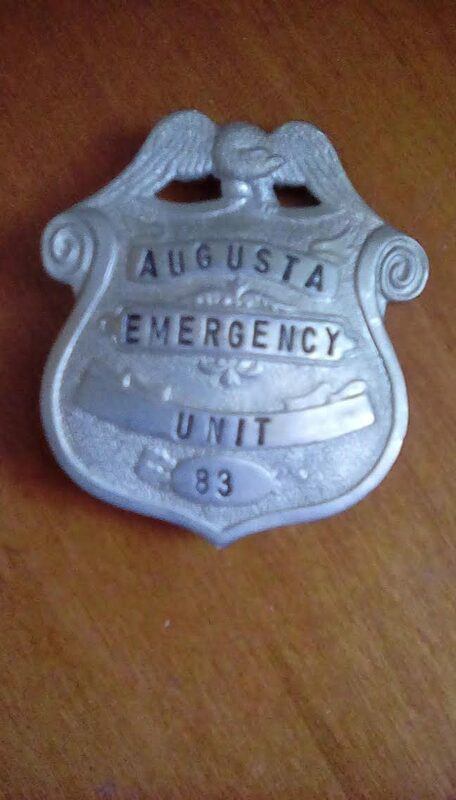 The small, 2.5” brass-toned badge marked Augusta Emergency Unit 83 is one item I thought would be easy to identify and attach to a more recent relative. How many ways can I be wrong? All of them, apparently. No one in my earlier generations has been a firefighter, police officer, paramedic, or any kind of auxiliary, and although my father was honored for pulling neighbors out of their burning homes, he was just a good Samaritan who did what he could. (It would have been comforting to know that he had planned an escape route instead of having to jump out a second story window for lack of any other escape!) My aunt was a WWII U.S. Army (Civilian) aircraft warning observer, but there is no indication she was issued such a badge. So I have no clear indication of this badge’s owner. Further research into my family materials gave no help, even in identifying the department that might have issued the badge. A long day at the Maine State Library searching local newspapers for clues was unrewarding. I sought help from Chief Audette and Deputy Chief Groder of the Augusta (Maine) Fire Department. 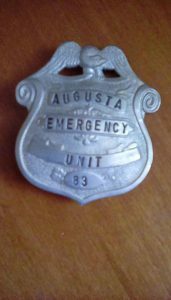 While they were interested, their departmental historical materials also gave no clue as to the origins of this badge, other than to indicate it was probably used before the 1960s when the department’s history is more complete – but still unhelpful. Because we all felt it had to have been in some way attached to the Fire Department, the badge remains with Chief Audette. Not every distraction from my squirrel bins will yield a story, greatly to my annoyance. Although the eagle is facing left (sinister) with head lowered, it is holding neither olive branch nor arrows in its talons, either of which might indicate a peacetime or wartime attitude. Newspaper research from about 1900 to 1950, an arbitrary choice of time period that might fit the badge’s use, gave no hints, no clues, and no help. Not every distraction from my squirrel bins will yield a story, greatly to my annoyance. While this badge no longer hides in my bins of memorabilia, it resides in my mind as a story I have yet to complete, one I cannot leave permanently untold. I couldn’t Find Hattie until I found her. The owner of this badge will remain unfound . . . until I find him – or her. Such is the lot of genealogists, historians, and researchers who search for that one ancestor, that one artifact, that one fact, date, or name to make the story complete. We keep looking and thinking about what we can’t find until we find it (or until serendipity lets us find it!). Perhaps our personal badges should display the image of a dog with a bone! About halfway down this page (http://portlandpolicereserves.com/aboutus_historyofthereserves.html), you will see a photo of a badge for 1940s “auxiliary police”. It has some similarities with the badge that you’ve shown. I once found a very curious newspaper clipping in memorabilia from my parents. It was about a fire at a hotel in West Virginia and some of the people being rescued. The article didn’t mention anyone I knew but my father had once lived in West Virginia. But ultimately, it had nothing to do with him. Later, I came across a letter on the very same hotel’s letterhead written by my grandfather. It seems he had stayed there once many years earlier so that solved that mystery. It could well be that the belonged to a friend of your family’s or was just found and someone thought it was cool so they kept it. I think the eagle facing left may be a clue. Perhaps it signifies looking east, toward the Atlantic. Maybe the owner was some sort of coast watcher or life guard. Two suggestions I am sure you thought of, but just in case. Post it on facebook asking for help identifying it. Go to the local historical society. The more people see it the more chance of it to be identified. Maybe not who had it, but what it means. Good luck. Keep digging. We had a famiiy mystery that started from a story my grandmother told. It took 30 years of off and on research, but we finally resolved it last year. The truth was far more incredible than we ever could have imagined when we started. 30 years of research yielding truth more incredible than imagined? Tell us more! Please. There’s an Augusta, KY on the Ohio River. Would you have had anyone who might have connections in that area? Good thought, but I haven’t found any indication that any of my family wandered to KY, OH, or GA. How different my family might be if they had! My father was not a fireman, but was given a fireman’s badge when he served as the chaplain for the town’s fire department. I don’t know if this information was documented by the fire department, but was noted by my father in the “life story” he left behind as well as the badge. Can you post a picture of the reverse side? Hi Carol, sorry, I didn’t take a photo of the back because it’s blank, just the relief of the front design. I like your analogies…it gave me a few ideas for beginning work on my squirrel bins. When my grandfather passed away in 1997 I was allowed to go through my grandparents house to pick out items. I found several items in a squirrel bin related to my grandmother’s service as an air raid warden during WW2 and her work at RCA. I also found a badge that had Remington Corp 213 Vigilence on it. I was told it was a Union badge. I’m still looking for information on it. The badge sits on my dresser as a reminder to keep searching.